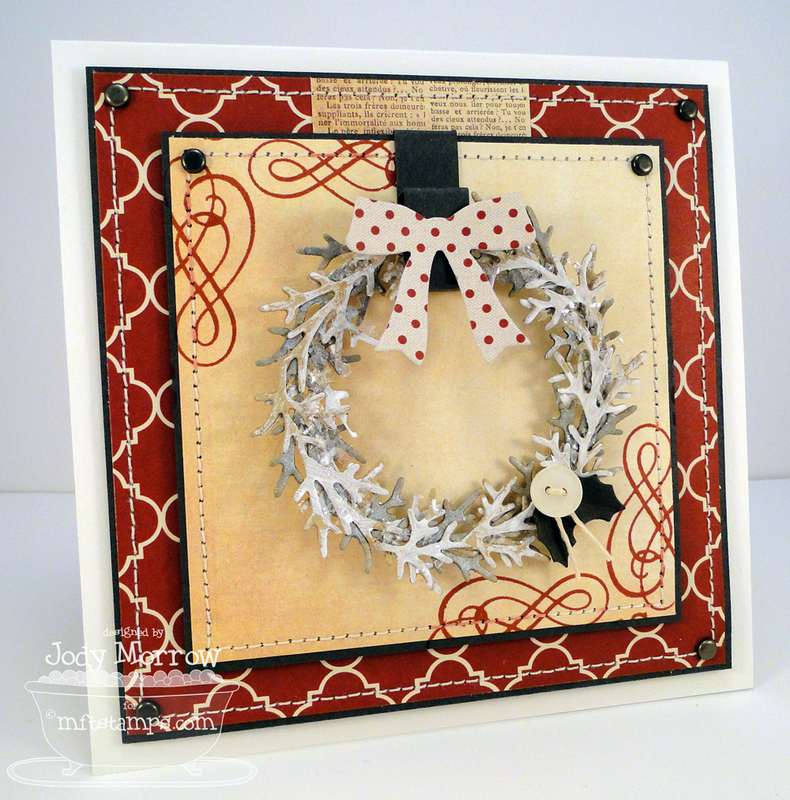 This week, I grabbed MFT's Winter Wreath and hung it on my card front. I have a "How-To" for you this week, so keep on scrolling for a little tutorial. 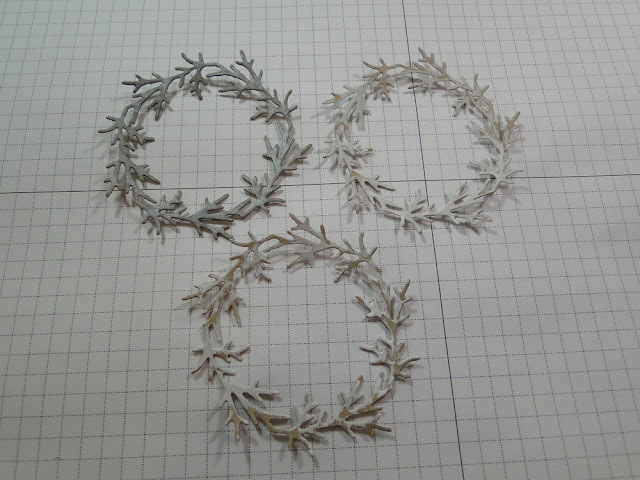 I love this delicate wreath. I cut it three times, painted each layer, and stacked them. I created a "door hanger"and strung it from that. 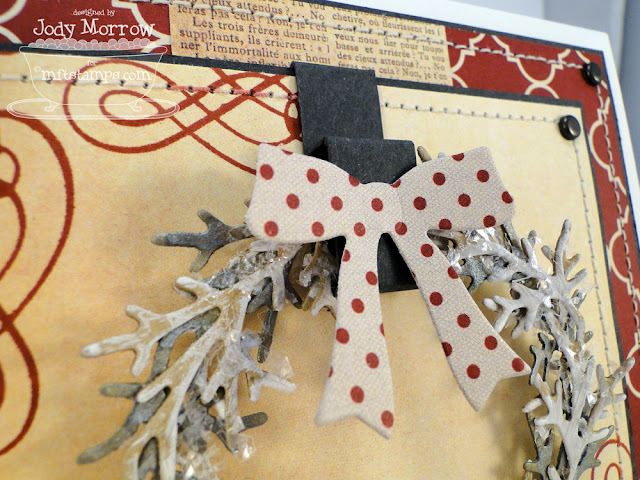 I added the included bow and some holiday garnish using Christmas Ornaments Die-namics and a Whip Cream Button. 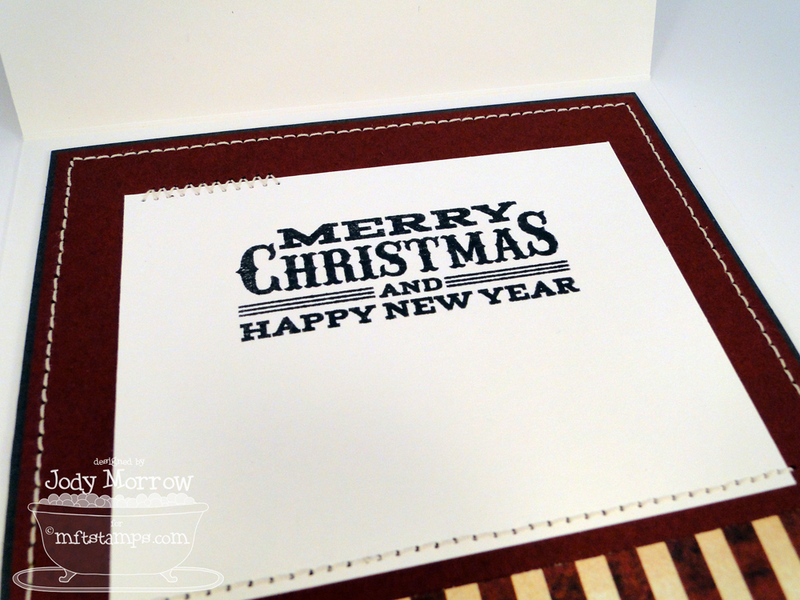 The flourishes are from the Seasonal Sentiments stamp set. The bow was cut from patterned paper from the My Mind's Eye All Is Bright patterned paper pad. 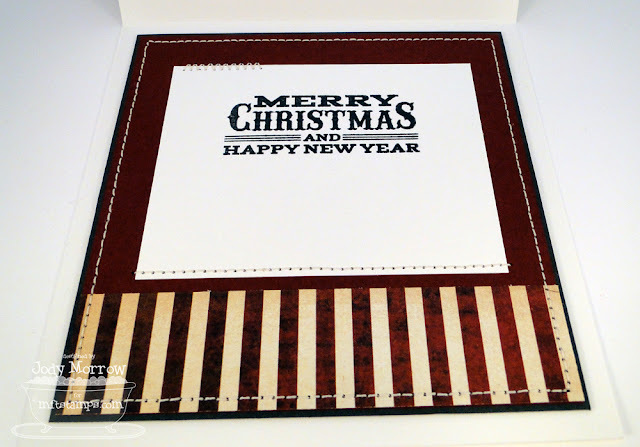 Here is a peek inside, showing another of the awesome sentiments from Seasonal Sentiments. 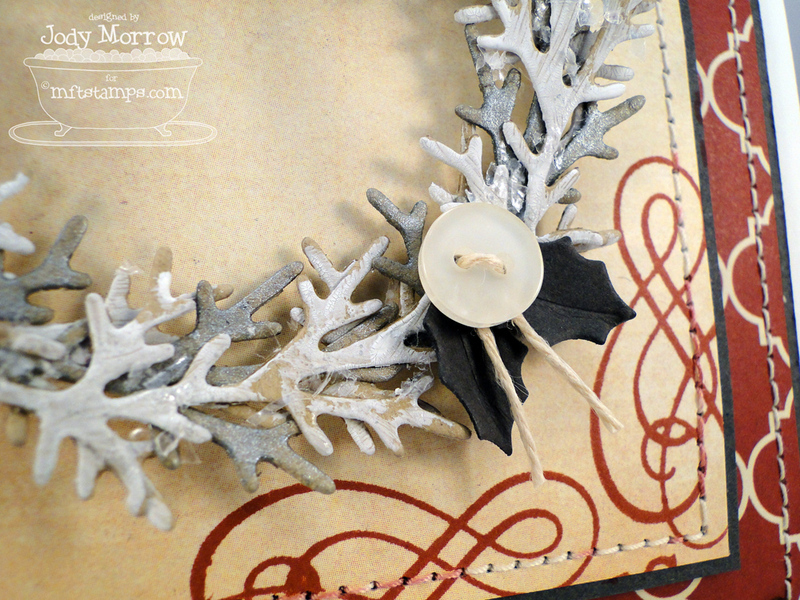 Here is a little tutorial for you showing how to create the wreath and door hanger. Cut three wreaths from Kraft Card Stock. Paint two of them lightly with Distress Crackle Paint. 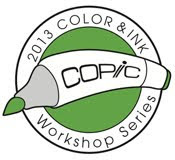 Spray one of them generously with Heidi Swapp Color Shine spray. Let all three dry (I used my heat tool). 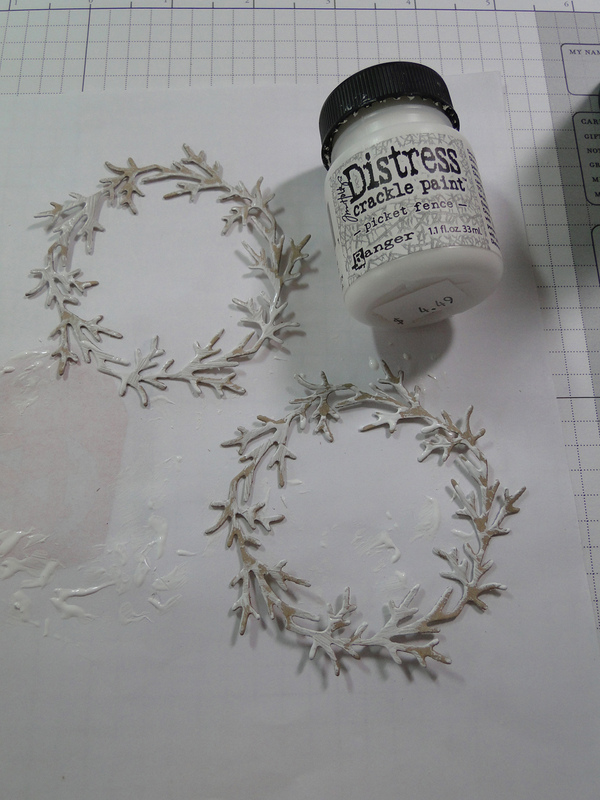 Assemble the three layers by dabbing glue randomly on one layer and laying the next one over it. I used a round bottle as a "rolling pin" to adhere the layers together. Then, sprinkle Martha Stewart Snow Glitter over it. 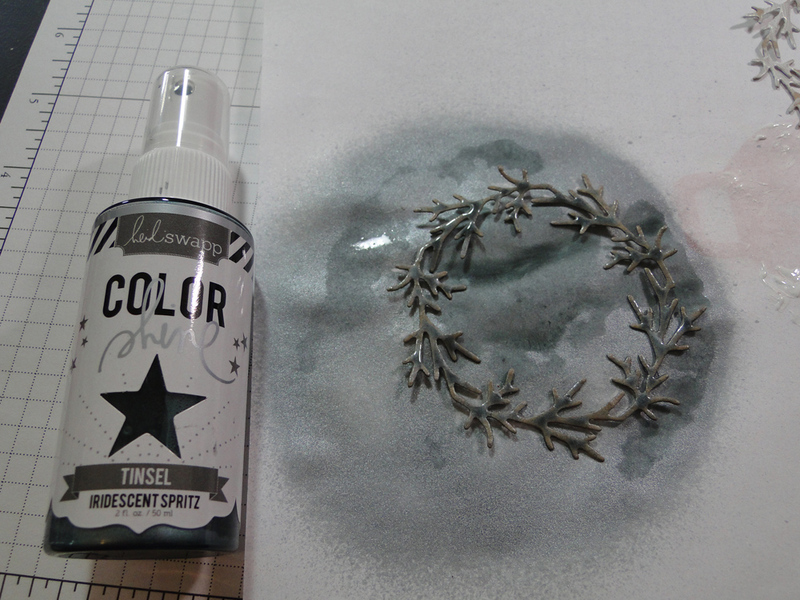 Any excess glue will be covered with the glitter and your wreath will have a nice dusting of non-imposing pizzaz. 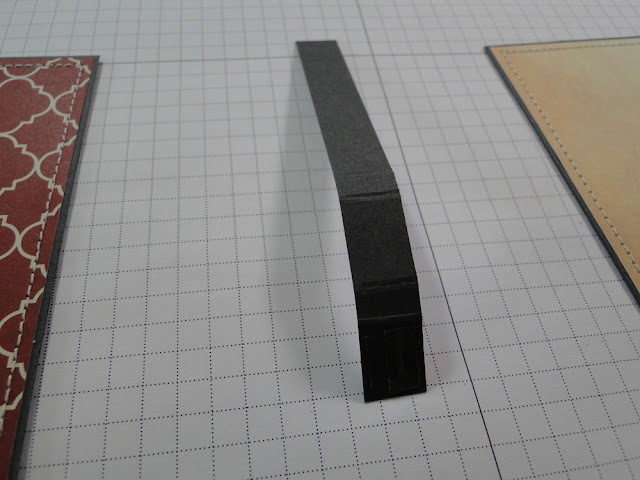 I cut a strip of Steel Gray Card Stock and scored in a couple places to create the "hanger". I made it 1/4" deep. Just eyeball this depending on where you want your wreath to hang. You will wrap your hanger around your wreath so it is trapped (and secured). 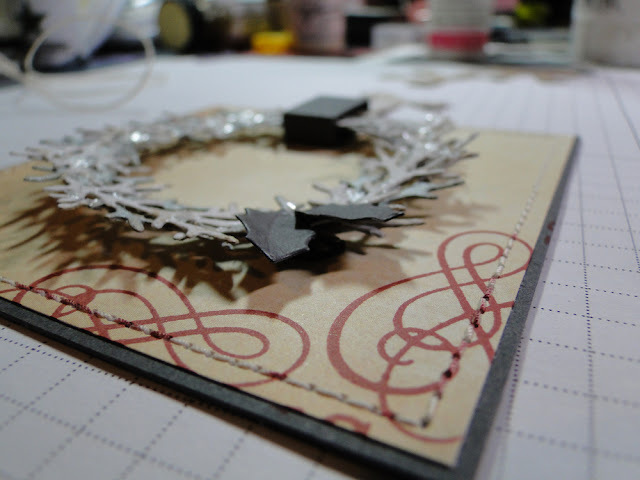 This will allow you to adhere your wreath to your card without needing glue on the back side of your wreath. 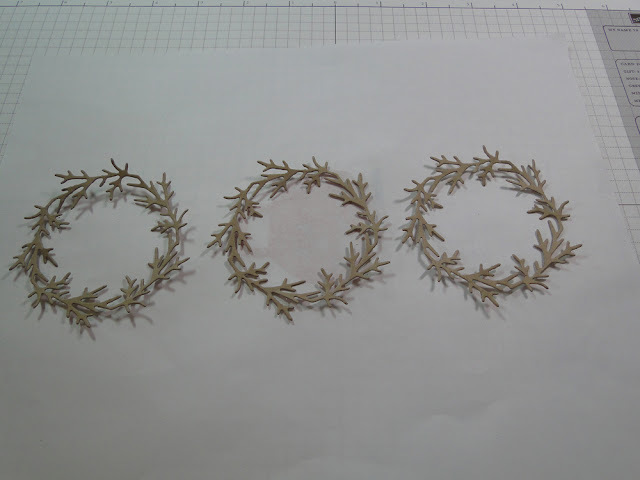 I added a tiny dimensional behind the holly leaves to give the wreath a little boost. 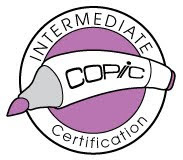 Here is another look at the completed card. this is so super cute, love the dp and the great design. 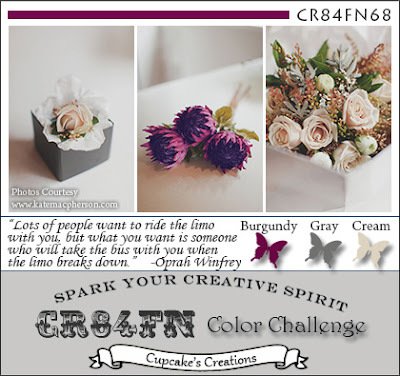 The tutorial is fabulous, gives me some ideas.....thanks for the inspiration! 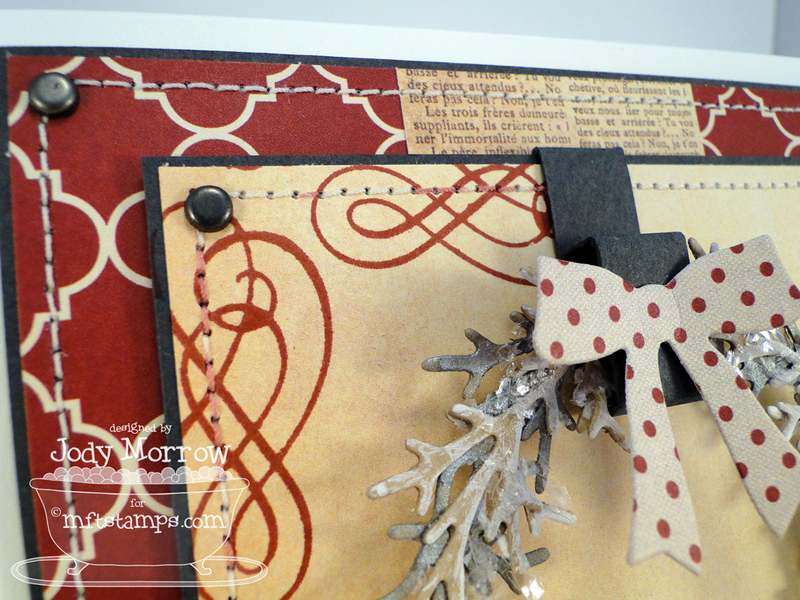 Absolutely gorgeous, I love the layered wreath, and the fab tutorial! I love it, Jody, thanks for the tutorial! The wreath is so pretty! Thanks for the great tutorial! Love how you made the hanger, too! So creative! Beautiful card! Jody, this is fabulous. 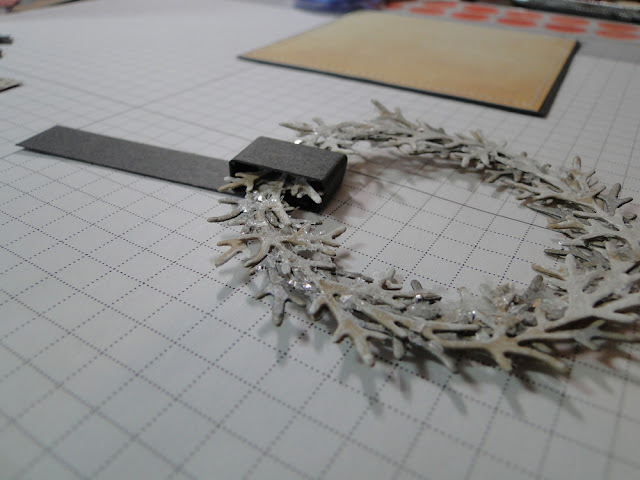 I love how delicate this wreath is, and you added just the right touch of glitter. The whole card is just outstanding. I love your work! soooo pretty, Jody. the flourishes really add an extra wow, to this card. 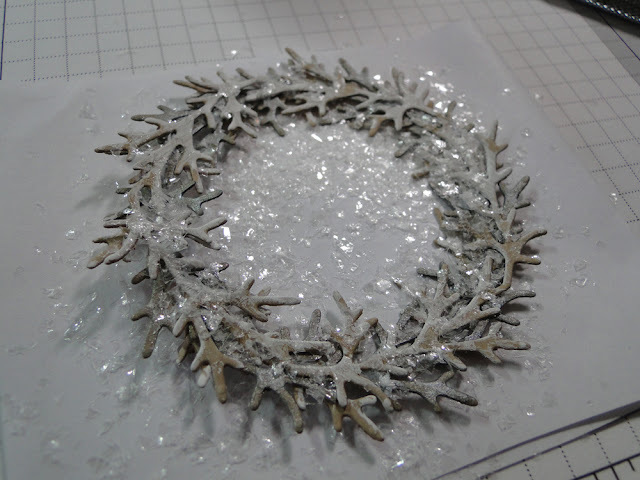 your wreath is gorgeous, too....love that snow glitter. Oh this is fab! Love the shimmer and shine on the Christmas wreath - great tutorial too! Another fabulous tutorial! Thanks for sharing this beautiful project!! This is absolutely STUNNING, Jody! 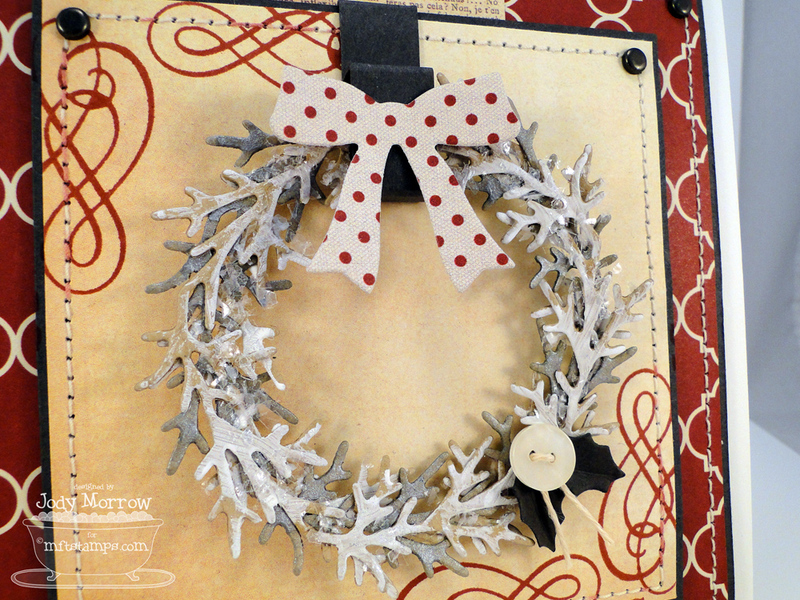 I love the wreath and the hanger...fab idea. The step by step tutorial is SO helpful too! Fabulous card Jody! Lovin' the shimmery sparkly wreath! Those little holly leafs are the cutest! Thanks for the tutorial! 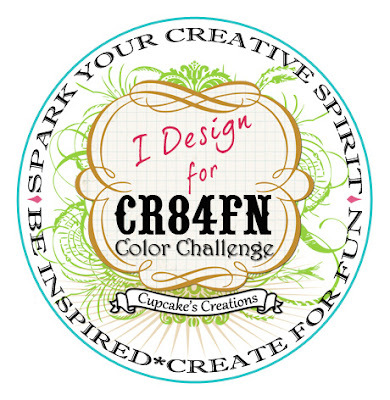 Thanks for joining CR84FN and sharing your creativity with us in 2012! Happy Holidays! This is just gorgeous Jody! 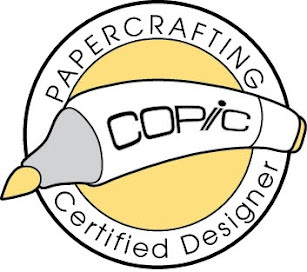 Thanks so much for sharing the how-to!! This is STUNNING!!! I LOVE the look of the wreath and the hanger is a brilliant idea!! Thanks for the tutorial!! Adore the wreath....looks fabulous! Clever idea for a hanger- thanks formthe tut!! Love how you used the swirls and masked the sentiment on the corners! Very cute! Thanks for the how to info. I really like the door hanger too. Jody, this is gorgeous! Love your wreath! 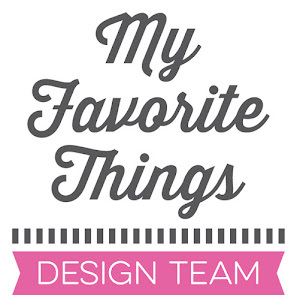 You are adding more items to my must have list with that spray....lol....it's pretty! What a wonderful posting! Definitely i will share this post with my social net friends. Thanks for the information...keep blogging! What a beautiful wreath! I love the bit of glitter on it!